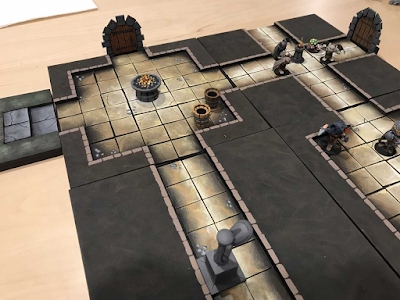 I have been working on how to run a dungeon crawl convention game that is sort of like what I ran a couple of years ago at Barrage: light rpg with a boardgame/minis game feel. I want it to be somewhat random, so that I can run the same game again and again but not have it be exactly the same so that people can play in it more than once if they want to. The biggest stumbling block, frankly, is how to do the dungeon itself. 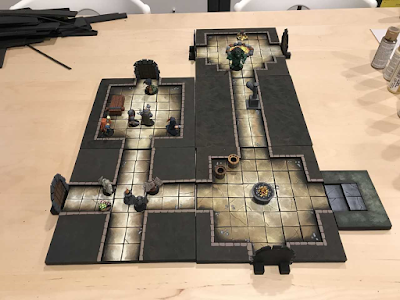 It obviously needs to be modular, but the ones I had before while modular, were a) too big in terms of how many spaces were on each tile, b) not uniform enough so that you could avoid situations when the dungeon build was impossible (such as having a hallway be too long because it goes into an existing room), and c) they looked more than a little on the boring side. The tiles were flat pieces of thin wood with spaces painted on them ... <yawn!>. 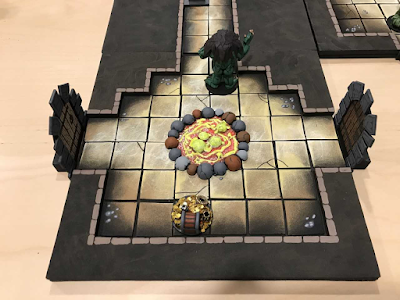 So I decided to take a look at the tiles used in some of the dungeon crawl board games. There are several on the market where you build the dungeon as you go and you never know how it is going to turn out because each piece of the dungeon is randomly determined. This is exactly what I needed! There are several out there, but the ones I liked the best were from a game called "Dungeonquest." 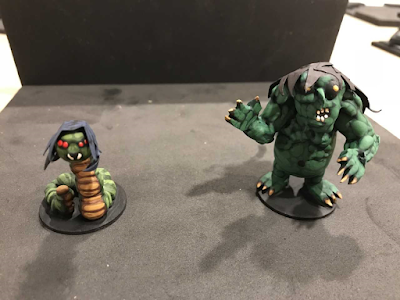 There are two versions, an old GW effort and an updated modern one, and both of them used the same types of tiles. They are squares with a random number of exits coming out of the tile. The thing is, though, that the exits are always centered in that side of the tile. 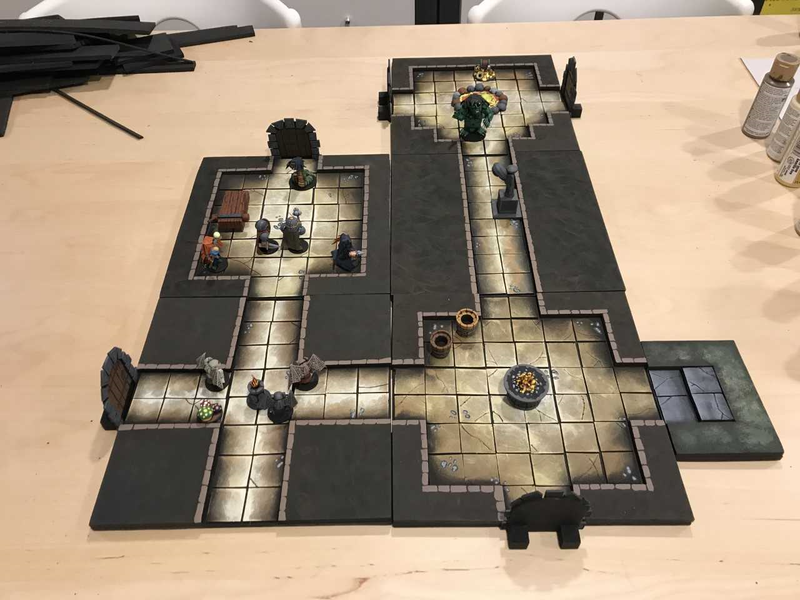 This makes building a dungeon really easy and you do not run into the "tile won't fit here" problem because all the tiles are the same size, same shape, and the exits are always in the same place. Perfect! Plus, honestly, I think they look really cool! So I decided to give it a go and make some out of foam. However, I wanted these to be a little more intricate than the foam ones I have been making which are essentially just a piece of thick foam with the floor painted on them and in some cases I draw on a grid. 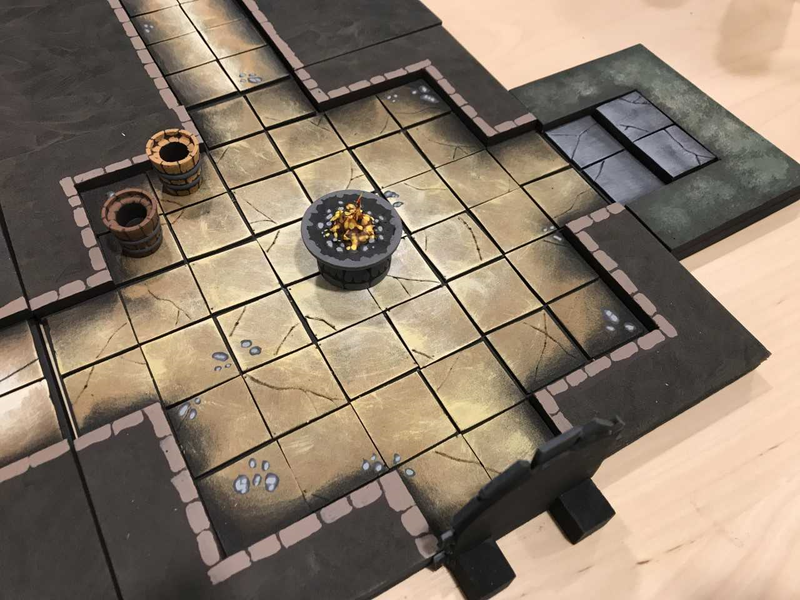 I wanted to use thick foam for the floor, thick foam for the sides, and thin foam for individual tiles. This would be some work, but I probably won't need more than 30 or so total tiles for a convention game that lasts a couple of hours. The entrance is there on the far right, stairs leading down to the dungeon from the outside. 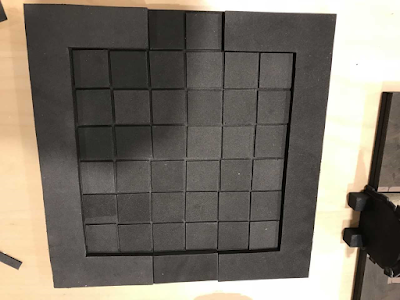 The rest of the pieces are all the same size (9" squares) with a border for each depending on the type of room or hallway it is, and 1 1/8" thin foam tiles for the "squares" of the board. I of course added some dungeon "furniture" and heroes and monsters for looks. Here are some close ups of the various tiles. First is the entry chamber. Next is the torture room complete with Naga. Now for the Troll's treasure chamber. 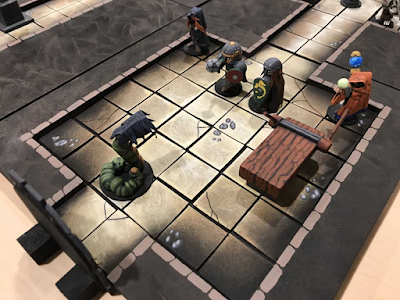 And finally another overview shot of a section of several tiles of the dungeon. Here is a shot of a constructed but not painted tile. It makes it a little easier to see all the pieces. This is a "dead end" room that has only one entrance (at the top). The tiles are durable, light, and easy to transport. 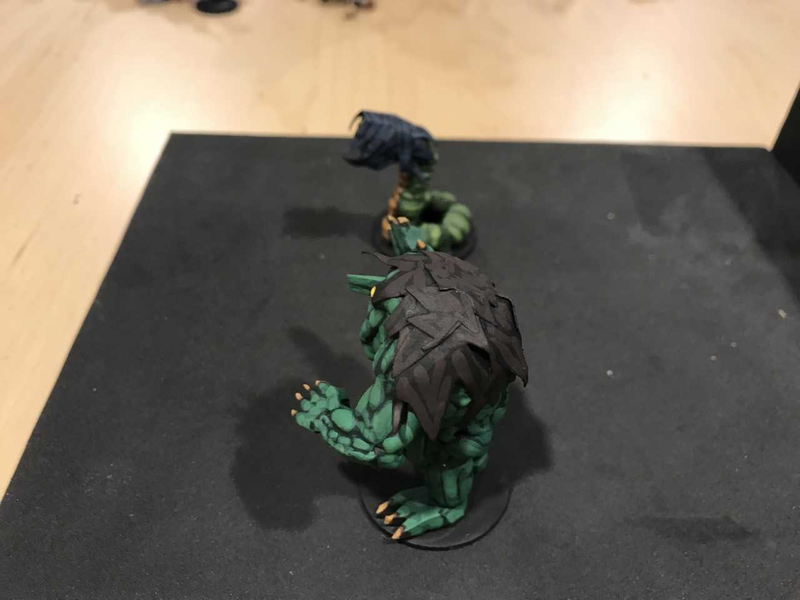 Since they are all the same size I can stack them easily and they should take up very little space in a box when transported relative to how much space on the table top they take up. The construction takes a little bit of time, but most of the time is waiting for the glue to dry. Painting them is a breeze. 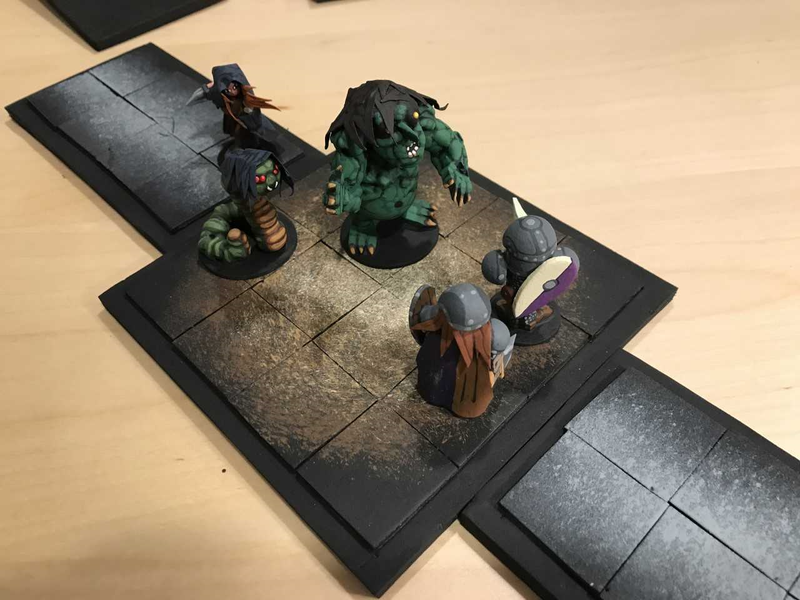 Although this might not be ideal for a traditional rpg situation where the rooms differ in size as do the hallways, for a convention board or minis based game, I think they will work very nicely. Sorry for the delayed update, but I was trying something new, new, new with a monster figure and I just finished painting it last night. So that means pictures today! 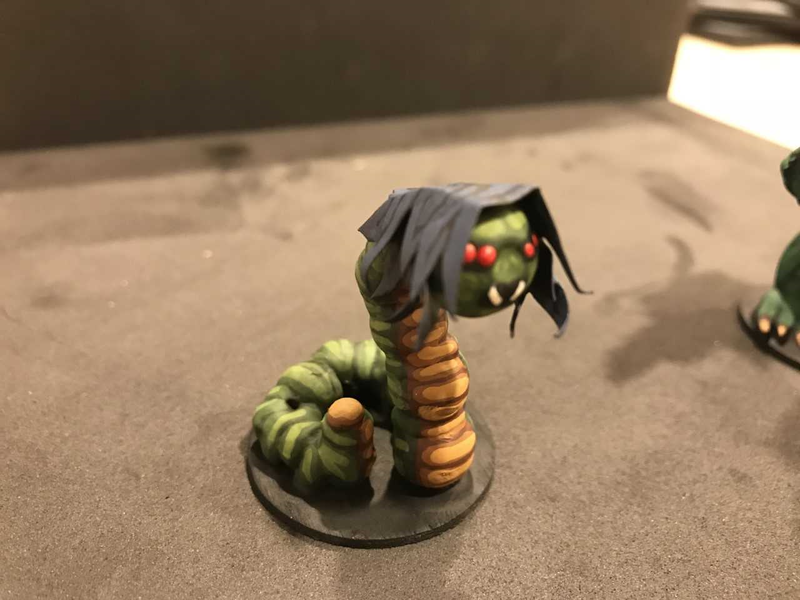 The Naga is just the bead tentacle construction I've been doing lately with a simple round bead head and hair like I do for the character figures. I like how she turned out, but nothing new construction or painting wise. 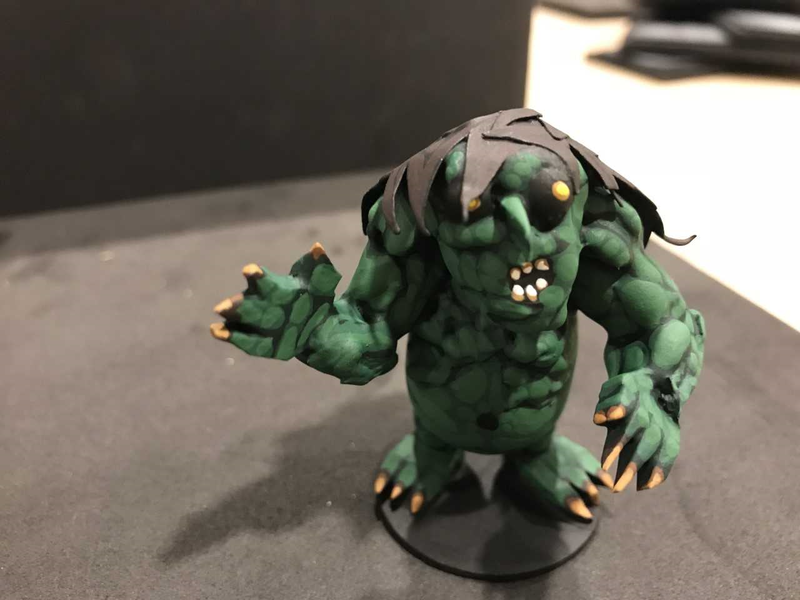 The troll on the other hand, is an all new construction. Honestly, he was a test figure and I absolutely did not like him at all until I painted him. So what's new you ask? You can't really see it in this picture, but his torso is completely different. I took two of the larger (I think they are 1.25") split eggs and glued them together smaller ends facing each other, but not overlapping completely. It produces "shoulders" in the back and a "belly" in the front. His arms and legs are the tapered beads, with hands a feet that are tile spacers. His head is a split wren's egg (the smallest split egg available) with a small bead split in two for the two eyes. The nose is also tile spacer, and the hair is paper. He also has two "buttocks" that are made with a split bead as well (you'll see them in a later picture). The arm muscles, mouth, facial contours, etc. are all done with the hot glue gun. 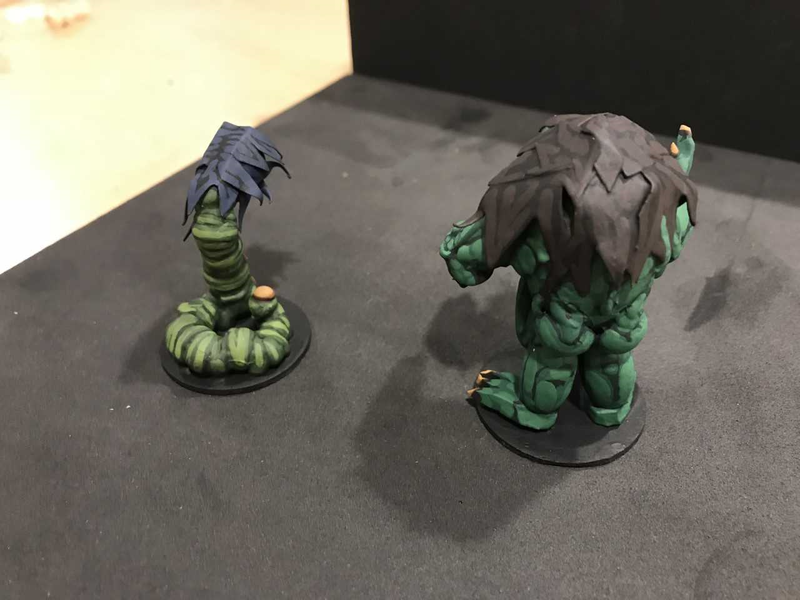 The Naga didn't look like much until I got the hair on her, then she really took shape. I'm happy with the figure, but I think next time I'll go with larger beads to make the figure larger and more impressive. This is a "young Naga" let's just say. I went for more anatomical correctness, and most of the time trolls don't wear any sort of clothing, so this is "pants optional Saturday." The two Fighters thought it was a good idea to bait the Naga and Troll forward so the Thief could get in a backstab ... but they are having second thoughts at this point!